Your safety is our top priority. (Of course, fun is next on the list!) All participants will receive a Frosty Moss Relay Team Guide containing detailed event and safety rules and a list of required gear. Please read it carefully in advance of relay day. This is a challenging event! 12-minute teams may find it difficult to make the 8p.m. cutoff. Recruit a fast friend to lend a hand, or expect that a race director may ask your team to skip a leg(s) to help you make the cutoff. There are many potential hazards in an event of this type, including but not limited to motor vehicle traffic, road and trail conditions, and weather. We ask that all Frosty Mossers take appropriate precautions to ensure a fun and safe event. 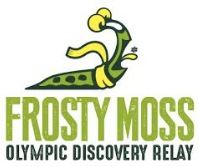 Please help us keep the Frosty Moss Relay safe by focusing on being safe runners and support crews. You don’t need to know the names of everyone on your team when you register. Your team captain will enter their contact info, the team’s name, if it’s a 3- or 5-runner team, and wave time based on overall average pace. On relay weekend, bring a completed team roster and signed liability waivers for each member of your team. Both forms are linked in the top menu bar. Frosty Moss Relay has a no refund policy. (Exceptions below.) If a registered team decides they cannot attend the event for any reason, there will be no refund of their registration fee regardless of when/if they notify the race directors. In the case of extreme weather or other events beyond our control, the race directors reserve the right to cancel the event up to and during the day of the event. In the case of a cancellation prior to the day of the event, the team captain (the person who registered your team) will receive a discount code that may be redeemed during a one-week priority registration period for the next year’s event. The race directors may offer additional refund options if the event is rescheduled or in other circumstances, including but not limited to being able to fill your spot with someone from the waiting list. If the event must be canceled or stopped prematurely on the day of the event, no refunds will be made. In the case of hazardous weather or other conditions beyond our control, the race directors may, at their discretion, alter the course for runners’ safety. This could mean reducing overall event distance, moving the start line, skipping a leg, running the same leg twice, etc. No refunds will be made in the event of course alterations. As much as possible, the decision to cancel, reschedule, and/or reroute will be made prior to the day of the event, though conditions may require same-day course alterations. That information will be relayed to exchange zones and course marshals, who will direct participants accordingly. All team captains should attend packet pickup on Friday, February 28, 4–6pm, at Barhop Brewing & Pizza, 124 W Railroad Ave., Port Angeles. Bring your completed roster and signed liability waivers for all team members. Relay teams may consist of 3 or 5 runners. Any age and gender, road and trail fans. Mix it up! Teams must average an overall 12-minute pace, ideally faster, including exchange points. This is a challenging course. Team up accordingly. Will We Run in the Dark? YES! Sunrise is at 6:55am, sunset is at 5:57pm on Leap Day. Runners must wear reflective vests, headlamps, and blinkie lights in dark hours. Runners may have a pacer during night legs, but they must stay together the entire leg. Yes! Teams finishing Leg 12 after 8:00pm will receive a “Go Directly to the Finish Line Party” pass (aka DNF). Race directors may DNF teams earlier or ask teams to skip a leg(s) to catch up. Yes! As with most relay events, teams provide their own in-race vehicle. If you have the space, we suggest enlisting a nonrunner friend to drive. Be prepared for a couple narrow forest roads. Yes! And so are the road crossings! When running on the side of a road or city street, runners should run against traffic. Cross only when traffic has cleared. Team vans should come prepared with food, drinks, extra layers, first-aid kit, and whatever else you’ll want with you during relay day. We’ve got the after-party food and bevvies covered! As long as your team can make the cutoff, you can move forward in whatever run/walk mode suits you. Professional speedwalkers welcome! We’d rather you didn’t. If you insist, keep the volume low so you can hear course marshals, passing runners, traffic, and cougars. If you can’t hear your own footsteps, the volume is too high. We love our dogs—and probably yours, too—but please leave them with a trusted dog sitter. Dogs are not allowed at the after-party. Where Should We Stay Before/After? Our 2019 title sponsor is Wirta Hospitality Worldwide, parent company to Holiday Inn Express & Suites and Quality Inn in Sequim. You can find more lodging options at the Olympic Peninsula Visitor Bureau. Trust us, once you spend the day running though the many spectacular Olympic Peninsula ecosystems, you’ll wonder why you spent February anywhere else.